The word ‘negligence’ denotes carelessness. In legal sense, it signifies failure to exercise standard of care which is expected by a reasonable man in the normal circumstances. In general, there is a legal duty to take care when it was reasonably foreseeable that failure to do so was likely to cause injury. Contributory negligence means the failure by a person to use reasonable care for the safety of either of himself or his property, so that he becomes blameworthy in part as an "author of his own wrong". The standard of care in contributory negligence is the same as in ordinary negligence; i.e., that which a reasonable person would have done under the same or similar circumstances. The act or omission of an injured party which amounts to contributory negligence must be a negligent act or omission, and it must serve as a proximate cause of the injury and not merely as a condition. Contributory negligence is one of the defenses of ‘negligence’. 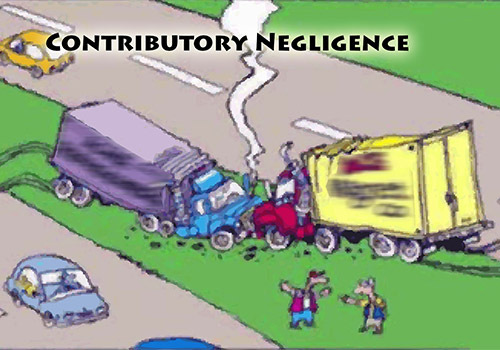 Indian Courts recognize the concept of contributory negligence. In the absence of reasonable care on the part of the claimant, courts are likely to reduce the liability of the injurer. The rule of negligence with the defense of contributory negligence holds an injurer liable if and only if he was negligent and the victim was not. In India, this rule requires proportional sharing of liability when both parties were negligent. That is, the compensation that the victim receives gets reduced in proportion to his or her negligence. For instance, if a person is hit by a bike while crossing the street, and that person failed to look before crossing, then his careless actions will be taken into consideration in a civil court setting. In this situation, his negligence will be reviewed and any compensation that he obtains may be reduced because of that person’s careless actions. The burden of proving the contributory negligence is on the defendant and if defendant does not take the plea of contributory negligence then the plaintiff is not bound to prove it. However, if the defendant proves the negligence of a plaintiff or claimant, then after that, the burden of proof is on a plaintiff to disprove his/her own negligence. Even if the plaintiff was negligent, the tortfeasor may still be held liable, if he or she had the last clear chance to prevent the injury. According to this last opportunity rule, when two persons are negligent, then the person, who had the last opportunity of avoiding the accident by taking ordinary care, should be liable for the loss. It means that if the defendant is negligent and the plaintiff having a later opportunity to avoid the consequences of the negligent act of the defendant does not observe any ordinary care, then he cannot make the defendant liable for that. Similarly, if the last opportunity to avoid the accident was with the defendant, he will be liable for the whole of the loss to the plaintiff. The defense of contributory negligence generally is not available for intentional torts or where the defendant is found to be guilty of wanton and willful misconduct. It can also be unavailable where the defendant has violated a statute clearly designed for the protection of the plaintiff. Contributory negligence is not a defense for strict liability torts unless the plaintiff has knowingly assumed an unreasonable risk. Roberts v. Ring – Ring was 77 years old and had impaired hearing and vision. While driving on a busy street he saw a seven year old boy run into his path but failed to stop in time to avoid hitting him. The court held that while the defendant cannot take advantage of impairments and infirmities to avoid a finding of negligence, the injured party is held to a standard that takes age and maturity into account. Solomon v. Shuell – Plain clothes police officers were arresting robbery suspects. The decedent thought the suspects were being attacked and was shot by one of the officers when he came out of his house with a gun. The court held that under the rescue doctrine, contributory negligence is not present if the rescuer had a reasonable belief that the victim was in actual danger. Kumari Poddar vs Chitagong Engineering and Electrical Supply Co Ltd, 1945 Cal 433: The defense of contributory negligence cannot succeed unless it is provided that the plaintiff was under a legal duty to take care for his own safety. Rural Transport Service vs. Bezlum Bibi, AIR (1980) Cal. 165: Bus conductor was not liable for the death of a passenger who climbed on the roof of the bus and was hit by a tree. R.Srinivasa v. K.M.Parasivamurthy - a child of about 6 years was hit by a lorry while standing just near the footpath. It was held that a child of that age doesn’t have the road sense like his elders and, therefore, the plaintiff, cannot be blamed for contributory negligence.